Research Blog: N.L.P + A.I. sequences, a relatively understudied problem. Spatial-temporal features are exploited for modeling of body gestures. 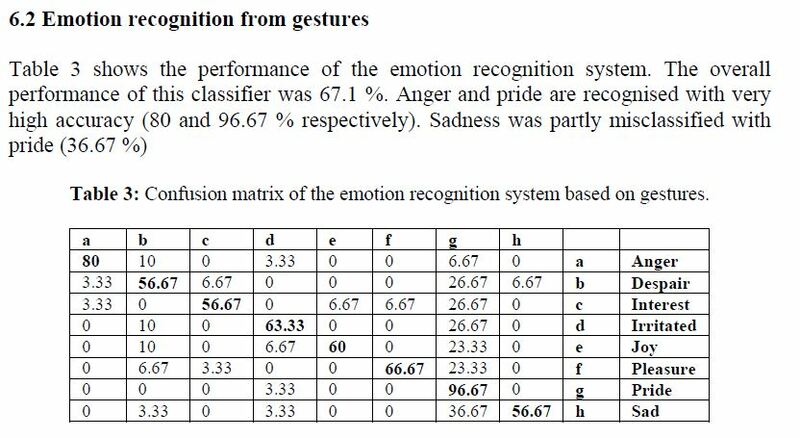 Moreover, we present to fuse facial expression and body gesture at the feature level using Canonical Correlation Analysis (CCA). By establishing the relationship between the two modalities, CCA derives a semantic “affect” space. Experimental results demonstrate the effectiveness of our approaches. 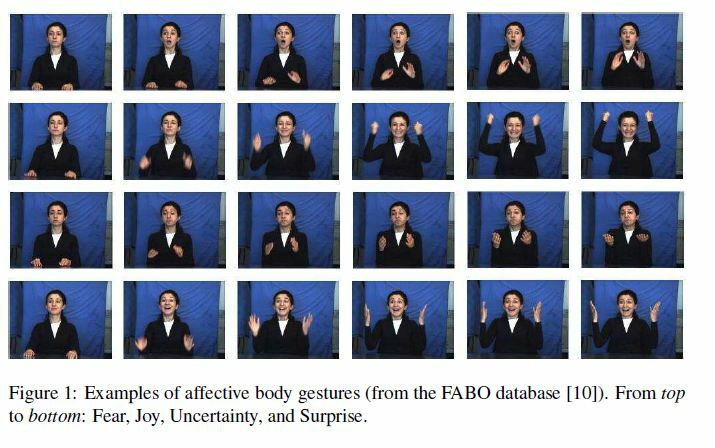 The Support Vector Machine (SVM) classifier to recognize affective body gestures. 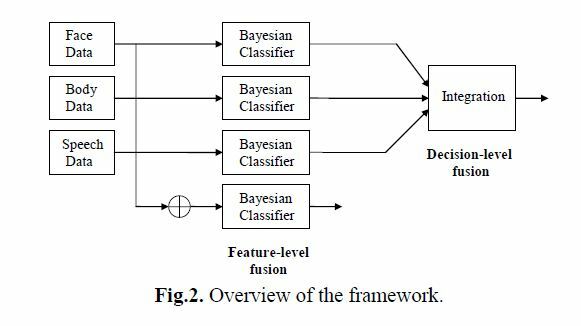 SVM is an optimal discriminant method based on the Bayesian learning theory. Key : semantic and pragmatic content of the intended message. – But when speech is ambiguous (Thompson & Massaro, 1986) or in a speech situation with some noise (Rogers, 1978), listeners do rely on gestural cues (and, the higher the noise-to-signal ratio, the more facilitation by gesture. – We believe that computers should not simply attempt to understand humans, they should generate human-like communicative behavior in response. We design communicative humanoid agents –animated human figures with faces and hands, and that can produce speech, intonation and appropriately timed gestures and regulatory facial movements. – This provisional solution produced pre-scripted gestural forms, and gestures redundant with the speech they accompanied, rather than complementary or non-redundant information. So, for example, the gesture in Figure 1 was produced by accessing the gesture dictionary once the concept of “writing a check” had been generated by the discourse planner. – In particular, we decided to look at the semantic features of ‘manner’, ‘path’, ‘telicity’ (whether a motion has an endpoint or goal), ‘speed’, and ‘aspect’ (inherent iterativity or duration) within verb phrases and gestures describing the movement of volitional agents (Coyotes, and Road Runners). 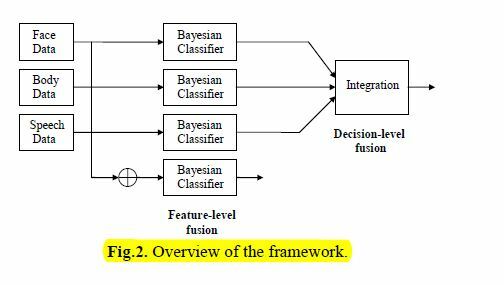 – Experiments using two different approaches for the decision-level fusion. The first approach consisted of selecting the emotion that received the best probability in the three modalities. 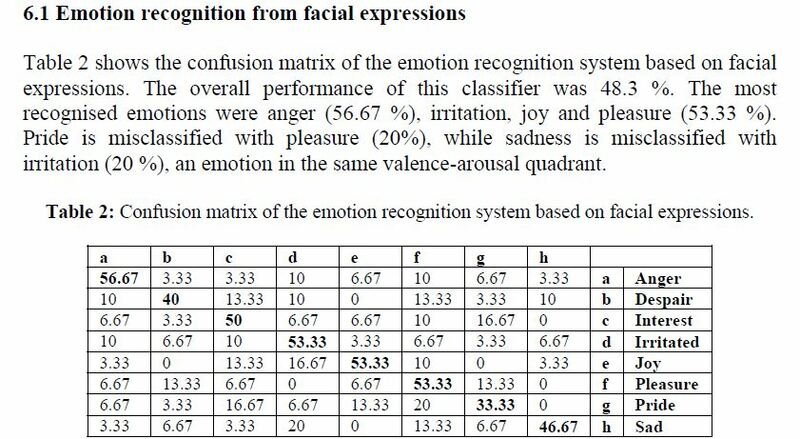 The second approach consisted of selecting the emotion that corresponds to the majority of ‘voting’ from the three modalities; if a majority was not possible to define (for example when each unimodal system gives in output a different emotion), the emotion that received the best probability in the three modalities was selected.